On July 26, 1952, UFOs made national headlines when they were sighted over Washington, D.C. The U.S. government has been protecting its citizens from the truth and the terror of extraterrestrial invasion since at least 1942. Many UFOlogists list February 25, 1942, as marking the beginning of the “war of the worlds,” the day when Earth first came under siege by extraterrestrial beings. In the days immediately after the sneak attack on Pearl Harbor on December 7, 1941, the entire West Coast of the United States was prepared for the likelihood of Japanese bombing raids. Then on February 25, 1942, the air raid sirens sounded the alarm throughout the city of Los Angeles. The U.S. Army’s Western Defense Command ordered an immediate blackout of the city from 2:25 to 7:21 A.M. Twelve thousand air raid wardens reported to their posts, and powerful searchlights swept the sky, capturing a large, round, white object in their beams. Antiaircraft batteries peppered the clouds with orange bursts of shrapnel—firing a total of two thousand rounds of twelve-pound high-explosive shells. However, no identifiable Japanese aircraft were ever detected in the searchlight beams. The next day, news photographs clearly depicted a large, round object that did not look like any conventional aircraft—Japanese or American. Some eyewitnesses described the mysterious object in the night sky as being large enough to dwarf an apartment house, and they watched as U.S. Army fighter planes were dispatched to attack the unidentified flying object and bring it down. Although the aerial “dogfight” lasted for about a half an hour, the fighters were unable to cause any apparent damage to the huge object. Some historians argue that the UFO sighted over Los Angeles on February 25, 1942, was an enormous Japanese Fugo balloon bomb. Constructed of rice paper and assembled by Japanese schoolgirls, the Fugo balloon bombs were directed into the jet stream that flows from Japan to America’s Northwest. Almost four hundred Fugo balloons exploded in Alaska, California, Texas, New Mexico, and Colorado, causing minimal damage but killing at least six civilians. However, according to records examined after the Japanese surrender in 1945, no documents were found to indicate that a gigantic Fugo balloon had ever been sent to attack Los Angeles. And even if such a massive balloon had found its way to California, it seems beyond comprehension that two thousand rounds of twelve-pound high-explosive shells and the bullets of machine guns from several fighter planes could not have brought down a floating craft made of rice paper as it moved slowly across the city. Although the aerial object remained untouched by intense antiaircraft fire and no bombs fell on the city, shell fragments raining down on homes, streets, and buildings killed six civilians throughout the Los Angeles area. In spite of official denials of the incident that were issued almost immediately, the Western Defense Command insisted that an unidentified aircraft had been sighted—and they had not been firing at a mass delusion. For the official record and to calm the anxious population of the West Coast, Navy Secretary Frank Knox stated that no aircraft, enemy or otherwise, had been sighted, and he characterized the Los Angeles raid as a false alarm caused by war nerves. On June 24, 1947, at 2 P.M., Kenneth Arnold took off from the Chehalis, Washington, airport in his personal plane and headed for Yakima, Washington. He hadn’t been in the air for more than three minutes when to the left and north of Mount Rainier he observed a chain of nine peculiar-looking objects flying from north to south at approximately 9,500 feet. He estimated the size of the objects to be approximately two-thirds that of a DC-4, and he timed the objects between Mount Rainier and Mount Adams and determined that they crossed this forty-seven-mile stretch in 1 minute and 42 seconds, equivalent to some 1,650 miles per hour. In an interview, Arnold described the objects as appearing like saucers skipping on water. This description was shortened to “flying saucers” by newspapermen and resulted in the popular use of that term. It was the Air Force’s conclusion that the objects of this sighting were due to a mirage, but for many individuals around the world, the mysterious objects that Arnold sighted that day were extraterrestrial spacecraft. On the night of July 2, 1947, eight days after Kenneth Arnold’s sighting of mysterious unidentified flying objects, a UFO was reported to have crashed on ranchland about sixty miles north of Roswell, New Mexico, and the Air Force had recovered the wreckage. The next day those startling media pronouncements were suddenly transformed into puzzling accounts that the Air Force had been mistaken. The supposed UFO was merely the scattered debris from a fallen weather balloon. For some people reading about the Air Force’s denial of their having captured a flying saucer, the matter was ended with a wry smile at the inefficiency of the military. Others wondered how highly trained Air Force personnel could possibly mistake a few thin sticks and scraps of cloth for any kind of aeronautical vehicle, to say nothing of an extraterrestrial craft capable of traversing the universe. Thus was born in Roswell, New Mexico, the seed of nearly every UFO government-cover-up conspiracy theory that still thrives today. In many ways 1947 provided the ideal soil for such theories to germinate. It had been almost exactly two years since the Japanese had surrendered and the terrible days of World War II had at last come to a close amid the fiery destruction of the nuclear bombs that devastated Hiroshima and Nagasaki. Atomic power frightened the great majority of Americans, and many doomsayers were frightening their audiences with grim messages that the world was about to come to an end. Adding to the stress was the fact that the Soviet Union had erected the so-called iron curtain, and the free nations of the world had to start worrying about the Communist menace before they had really had time to recover from the Nazi’s Third Reich. In fact, many military officers said that the flying saucers were a new secret weapon launched against the United States by diehard Nazis hiding in South America. Other people in “the know” claimed that the bizarre circular craft were new weapons that had been created by the German scientists who had been kidnapped by the Soviets during the last days of the war. After government agencies cleaned up the crash fragments and the alien corpses outside of Roswell, the bodies were taken to Hangar 18 and the bits of extraterrestrial technology were taken to hidden hangers at Groom Lake, a secret base in the Nevada desert. In 1989 a former government scientist named Bob Lazar broke his silence and revealed that he had worked on alien technology at a facility in Area 51. Not only had the scientists been able to reverse-engineer alien technology and create top-secret aerial vehicles for the Air Force, but hidden hangars concealed as many as nine extraterrestrial space craft. In 1987, UFO researchers Jamie Shandera, Stanton Friedman, and William Moore released their findings regarding a secret group known as Majestic-12 that was created in 1947 to keep the president and other world leaders briefed on the progress of alien activity on Earth. While the governments of Earth officially deny the existence of UFOs to prevent panic among the masses, the chief executives are well aware of the existence of extraterrestrial involvement in world affairs. 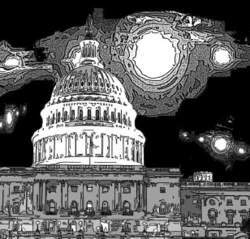 Other UFOlogists claimed to have discovered that a secret arm of the U.S. government, in association with the Illuminati, made a deal with the alien invaders to trade advanced extraterrestrial technology for such Earth resources as water, minerals, cattle—and certain of its citizens. UFO abductions are conducted by aliens as a species-monitoring program. Physical examinations of humans and crossbreeding attempts involving preselected men and women are allowed by the government as a treaty concession. On July 26, 1952, UFOs made national headlines when they were sighted over Washington, D.C. The mysterious objects were detected on civilian and military radar screens, and fighter planes were dispatched to investigate. Exactly fifty years later to the day, July 26, 2002, the North American Aerospace Defense Command scrambled two Air National Guard F-16 jets out of Andrews Air Force Base to investigate unknown aerial craft over the nation’s capital. On each occasion, the UFO raid was explained as a natural phenomenon. On June 24, 1997—the fiftieth anniversary of Kenneth Arnold’s sighting of the flying saucers in Washington State—the United States Air Force conducted a special Pentagon briefing and announced its answer to the charges of a conspiracy at Roswell in the document The Roswell Report: Case Closed. The debris found at the crash site outside of Roswell were fragments from a balloon from Project Mogul, a top-secret intelligence gathering operation, that had begun immediately after the end of World War II. Its mission had been to spy on the Soviets and to monitor their nuclear program; therefore, the cover-up had been necessary for purposes of national security. The Air Force report went on to state that the alleged bodies seen around the crash site were not those of extraterrestrial beings, but were dummies, roughly the size of humans, that had been used in experiments with high-altitude parachutes. After each of the experimental drops, which had begun in 1953, Air Force personnel would retrieve the simulated human forms. Apparently, folks around Roswell got the idea that they had observed military personnel picking up alien bodies. UFO researchers scorned such an explanation of the alleged crash debris having been a balloon and the true nature of the alien corpses having been parachute dummies. And then there was the question of how witnesses who saw the wreckage of a flying saucer and the bodies of its alien crew in 1947 could have confused the event with the discovery of dummies dropped over the desert near Roswell in 1953. The Air Force had an answer for that mystery as well. The seeming six-year discrepancy between the events was a manifestation of the mental phenomenon of “time compression.” Time compression occurs when a person’s memory splices events separated by many years into “compressed” segments of time. Civilians who witnessed the crash site of a weather balloon in 1947 and, six years later, saw Air Force personnel retrieving crash dummies dropped from the skies, recalled the two events as one in their compressed memories. The official explanation issued by the Air Force in their publication The Roswell Report: Case Closed accomplished little in quelling the accusations of a government conspiracy regarding the mystery of what really occurred in July 1947. Roswell has become a mecca for UFO believers from all over the world, and the city hosts an annual celebration to honor the alleged crash of the flying saucer in the desert. As the year 2000 grew nearer, many fundamentalist religious leaders became obsessed with fears concerning the Millennium and Armageddon, the great final battle between good and evil. Such an obsession created a mind-set of suspicion that had many members of these religious groups identifying Satan’s minions gathering to fight the forces of good as aliens arriving on UFOs. A number of fundamentalist Christian evangelists began to blend accounts of UFOs with the old fears of secret societies composed of top U.S. government officials, politicians, corporate chairmen, and international bankers who were seeking to bring into being a dreaded “New World Order.” Rumors spread that extraterrestrials and powerful members of secret societies had agreed that shortly before the year 2000 a carefully staged false alien invasion would convince the masses of the world that an attack from outer space was about to begin. People of all nations would believe the leaders who advised that unconditional surrender to the aliens was for everyone’s own good. Immediately following their betrayal of Earth to the aliens, the united leaders would form a One World Government, a New World Order, thus fulfilling biblical prophecies about a return to the days of Babylon. The aliens would reveal themselves as demonic entities, and the planet would be in torment until Jesus returned to deal the final blow to the armies of evil. In June 1998 a CNN/Time poll found that 27 percent of all Americans believe that aliens have already visited Earth, and 80 percent maintain that the government is conducting a cover-up to keep the truth of extraterrestrial visitation from the general population. On June 8, 1999, a National Institute of Science/Roper Poll surveyed a nationwide sampling of men and women and found that 25 percent believed UFOs to be alien spacecraft and another 12 percent thought them to be vehicles of a secret government agency.